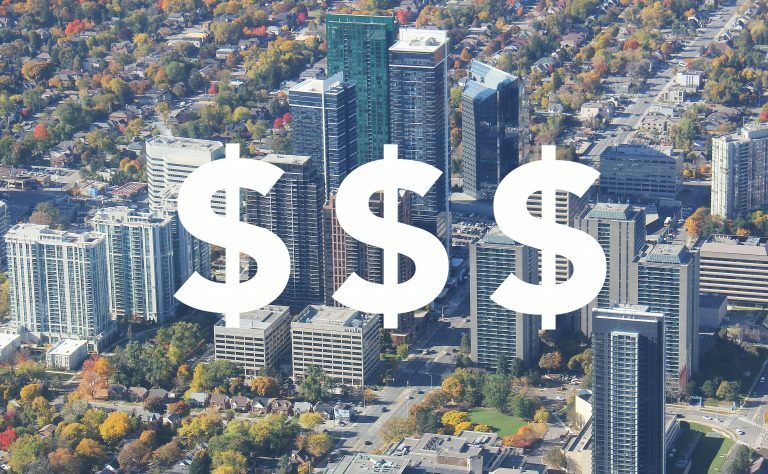 Condo Maintenance Fees - Where's the $$$ Going? In this example, all utilities are included in the maintenance fees. Any condos built after 2010 are required to have electricity individually metered (Energy Consumer Protection Act 2010). The largest percentage of the fees go towards Utilities 32%, Reserve Fund 32%, and the Services 24%. 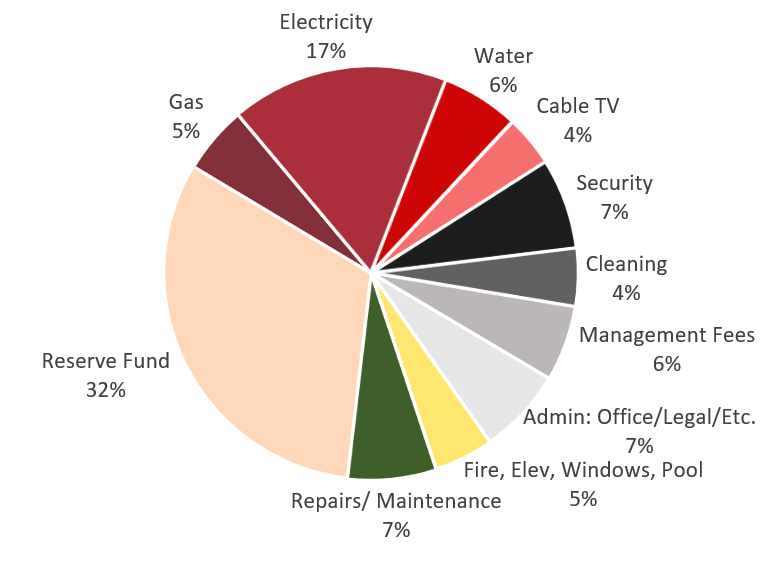 Maintenance fees are based on a percentage of the owners are of the entire buildings. More recently, including the percentage of parking space and locker areas as well. EVERYTHING COSTS MONEY. Elevators are a prime example at $5-$10k each elevator per year. Don’t just look at the number, look at the maintenance fee per square foot. It gives you a much better comparison point. Brand new condos often need 2 or 3 years to “discover” the actual costs of operating the building. Often the builders advertised 49cents/foot total maintenance fee is impossible to balance a budget with. Most well run buildings have maintenance fees closer to 65 cents per foot. New buildings are often great investments, but buyers be warned, they’re dreaming if relying on 49cents per foot for budgeting. Be kind to the Condo Board Members – Often they are just the messenger doing a thankless job. They are volunteers doing what they believe is best for the good of all owners. At times the messengers of bad news (“special assessments” or maintenance fee increases) like a loving mother ripping off a band aid. The Condo Board Act makes Condo Board Members personally liable for not following recommendations of stipulated Reserve Fund Studies. Services (management, security, cleaning) are often easiest places to save money by reducing or eliminating services, or changing existing suppliers with inflated rates. Almost all other costs are unavoidable (Utilities, Reserve fund contributions). Lawsuits are killers. Sometimes unavoidable, but avoid them where you can. There are some horror stories of condo boards pushing minor rule compliance that results in costs of hundreds of thousands of dollars in legal bills. Sometimes a “Special Assessment” (one time charge to all owners) may be the better option for collecting money for an unexpected expense vs increasing maintenance fees. Don’t overlook the Reserve Fund Study, which shows the money saved for future renovations and updates required. Engineers assess the building for future major costs (New roof, boilers, chillers, balconies, Common area updating) and Accountants forecast savings and expenditures applied. Healthy Reserve Fund values are key for predicting stable maintenance fees. “Death & Taxes PLUS Maintenance Fees” – Pay those fees! It will cost you more if you don’t. All lawyer and collection fees associated with recovering them will be rightfully charged to you anyway. Look at the big numbers and pick your battles. Don’t complain about a $20 expense for pizza ordered by the board for a 3hr meeting, where they are making big impact decisions regarding a $3,500,000 budget. Thinking of buying or selling a condo? We make it our business to keep up to speed with all buildings, and explaining the things that will impact you over the time of ownership. Contact us at team@oulahen.com with any questions.